New Titles Coming to the Free Library in September! Can you believe that we’re talking about September already? Finding a common theme in this month’s titles was elusive, so September’s main claim to fame is being used as the unifying feature – Back to School. If you’re dreading the return to the classroom, we have new titles that will help you escape to your happy place. Or, if you’re looking forward to the return of peace and quiet that the school day will bring, check out these titles to enjoy your new-found quiet time. There are new titles for the whole family throughout our catalog or at a neighborhood library near you! Sarabella is a thinker and a dreamer. In school, her understanding teacher worries that she may need help focusing. A new assignment helps Sarabella reveal and share her powerful imagination. Sarabella’s wild and inventive thoughts are beautifully illustrated by local author/illustrator Judy Schachner, in a lovely ode to daydreaming and to staying true to oneself. 12 year-old Lolly is dealing with the gang-related murder of his older brother and pressure to join a "crew" in his neighborhood in Harlem. Then his mother’s girlfriend brings him two large bags of loose LEGOs that were being discarded at the toy store where she works. Lolly loves them, but this huge pile came with no instructions. Find out what Lolly builds and the new relationships he forges in this great new book! From New York Times bestselling author Marie Lu comes a SciFi thriller set in the world of competitive online gaming. Emika Chen works as a bounty hunter for the worldwide gaming obsession Warcross – tracking down people illegally betting on the game. But when the game’s designer asks her to go undercover in this year’s tournament to discover security leaks will she, and the world, be prepared for what she finds? The story of Biltmore, the Vanderbilt mansion in Asheville, NC, spans two world wars, the Jazz Age, the Great Depression, and features a cast of real life characters including Edith Wharton, the Fitzgerald’s, and Thomas Wolfe. Kiernan follows the lives of Vanderbilt-fortune heir George and his wife, Edith Stuyvesant Dresser, who, after George's sudden death in 1914, led Biltmore through WWI and saved her husband’s beloved obsession. Chronicles the life and death of Tupac Shakur from his early days in New York City to his evolution into being one of the most recognized, influential, and controversial voices in the world before his untimely death at the age of 25. Against all odds, Shakur's raw talent, powerful lyrics, and revolutionary mind-set propelled him into becoming a cultural icon whose legacy continues to grow long after his passing. 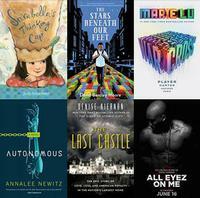 Add a Comment to New Titles Coming to the Free Library in September!